Went to watch the latest Mission: Impossible movie the other day. Was looking forward to it especially since it was getting lots of good reviews. For example, 97% on Rotten Tomatoes and 5/5 on Empire magazine. When I left the cinema, my initial thoughts was that it was “good” but not brilliant. I’d built it up to much with those really good reviews. However, thinking about it since, I will actually say it is a really good movie and well worth watching. A really good movie! Although it could have done with cutting a few scenes and reducing total running time – which is about 2.5 hours. (I know I say movies could do with being shorter often – doesn’t make something a bad movie though). Although the movie was so long, it sort of didn’t feel that long. Sometimes with movies more than 2 hours, you can feel a bit sleepy and you notice the seat isn’t as comfy as it was 2 hours ago. This didn’t happen (ok, maybe a bit about third way through) but rest of it was almost all edge of the seat. It did “help” that the Odeon cinema we were in had the air-con on turned to the max so too cold to feel sleepy!! LOL. I think they still have it set it when it was 30C+. I am just glad I didn’t decided to wear a jacket – but still felt bit cold! Back to the actual movie. As you would expect with a Mission: Impossible movie there is lots of action, lots of stunts. I am sure you have seen clips of some of the stunts. If you have seen the trailer, you will have seen some – but not all. Although I have watched the trailers since and I think it has a pretty big spoiler in it – the most recent trailer. The 1st one release in February I think is OK but the one released about 2 months ago had the spoiler. (Talking about spoilers, the opening credits of the movie shows a load of different clips from the movie – you are about to watch – although they are just shown for a second so you can’t totally see whats happening. But I feel unnecessary – do they do this in other MI movies?? I can’t remember). 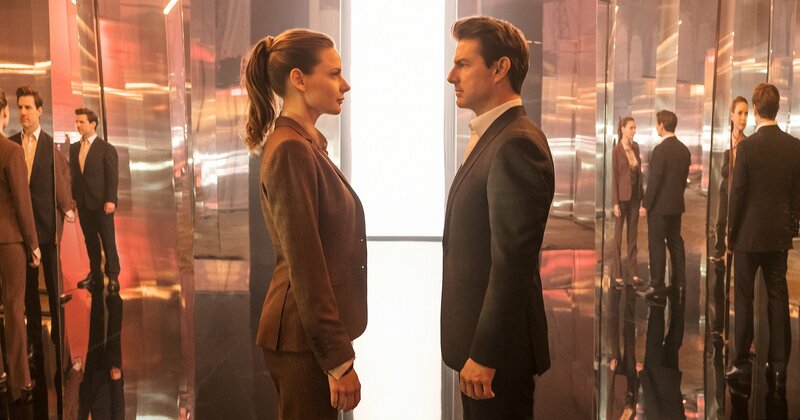 Mission: Impossible – Fallout in a way is the first sequel. 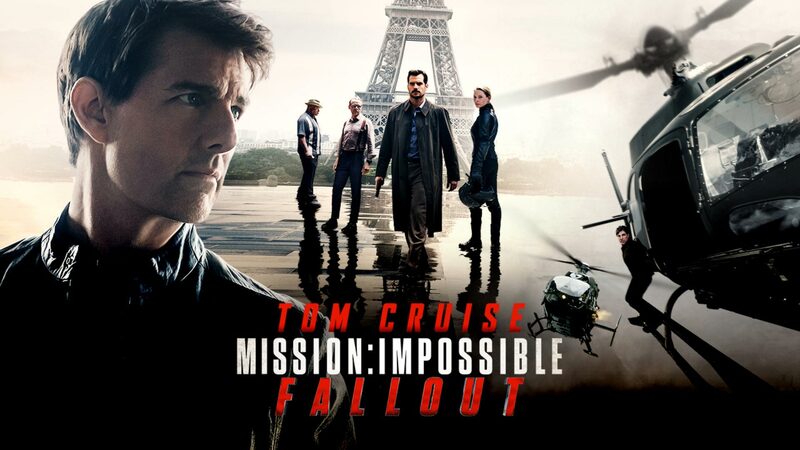 This is the first time where the director has directed another Mission: Impossible movie. Christopher McQuarrie directed the previous MI movie out a few years ago – and it follows on from that. You get the familiar characters. Ving Rhames of course is back (he’s in all of them). And Simon Pegg and Rebecca Ferguson are back. 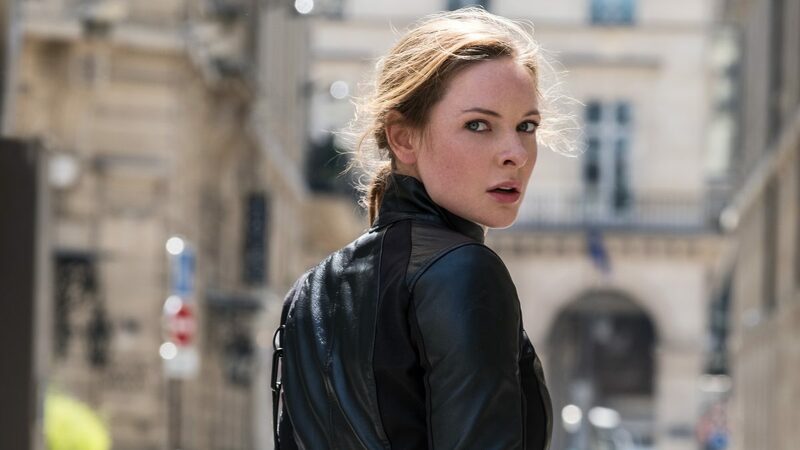 All good – but in particular Rebecca Ferguson. New character/actor to Mission: Impossible is Henry Cavill – with THAT moustache! (If you don’t know, he had his moustache digitally removed from some of his scenes in Justice League. It resulted in a weird looking upper lip. After filming Justice League, he was filming Mission: Impossible but Justice League required some reshoots. Paramount Pictures, who make Mission: Impossible refused to allow him to shave the moustache. 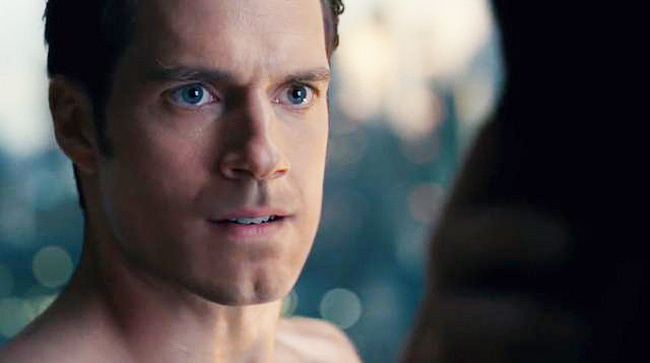 A visual effects artist behind the Justice League CGI has claimed since that everyone in the special effects team on Justice League were not happy with the work on the moustache and that they had limited time to digitally remove it. Forgetting all that, I thought Henry Cavill was really good. That fight scene in the bathroom. The power and ferocity! I have read that his character’s fighting style in MI was developed with the physicality of Henry Cavill in mind. And you can tell. He was actually referred to in the movie as like “the hammer” – with Ethan Hunt (Tom Cruise) more the scalpel. Henry Cavill – possible future James Bond? But of course Mission: Impossible is really all about Tom Cruise. He is the definition of an action movie star. He is basically a stunt man now. Some of the things he does is crazy – safety ropes or not. The helicopter scene. In particular the dive – or the “corkscrew dive”. Apparently one of the most difficult manoeuvres you can do in a helicopter. And Tom Cruise learn’t how to do it. He previously didn’t even have a helicopter lessons (you’d think Tom Cruise would!) and took 3 months to learn and to do the corkscrew dive. So he himself did the crazy, difficult stunt – and at same time as acting (and looking cool). And there is the scene he jumps from one building to another. Sure you have heard about this and how he got injured. But if not, he jumped a big gap to another building. Plan was always for him to not quite make it over and be dangling and then pull himself up. BUT the plan was for not the break his ankle in the process. Basically his ankle went back at an angle an ankle should not be. The discussed in detail on the Graham Norton show including a close-up. So don’t watch if squeamish. They actually used that clip in the movie where he broke his ankle but when he climbed up and hobbled passed the camera. And even scenes like him riding a motorbike through Paris. Thats Tom Cruise riding at fast speeds on a motorbike without a helmet. Tom Cruise definitely earned his $28,000,000 he apparently got for M:I – Fallout. There are many other stunts/scenes which are brilliant but I won’t spoil them. Some are in the trailer if you want to watch – or just go watch the movie!! One final thing to mention was that I got a little confused with the names and who people were talking about and if they were talking about. One person had the surname Lane, another person had first name Lark. And they sometimes talked about both in same conversation! Here is the 1st trailer which was released – which doesn’t have the pretty big spoiler. Going back to how much Tom Cruise was paid for M:I – Fallout. 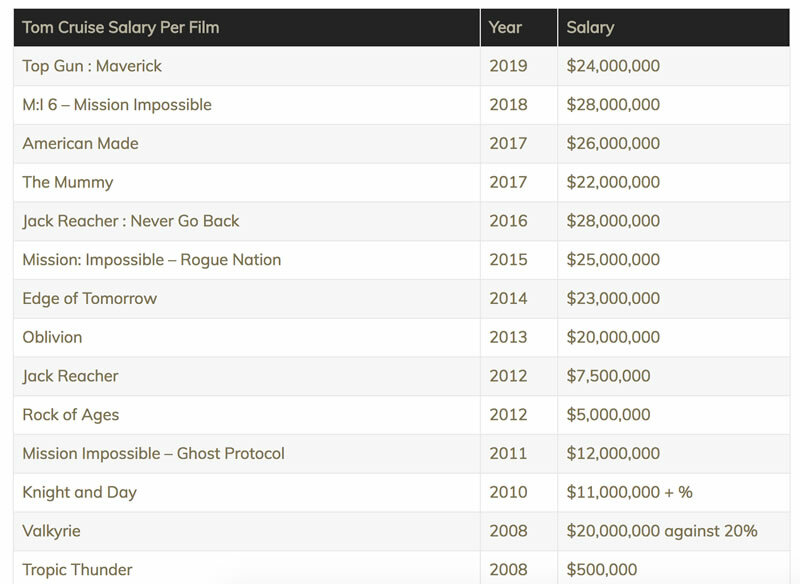 Since 2013 he has made pretty much 1 movie per year and earned at least $20m each. But when you look at what he earned for other movies, he was very clever to get paid a percentage of gross for some movies. For the first Mission: Impossible, he apparently got $70m! The 2nd one, $75m too! Probably not able to get same deal nowadays! !